Really good coffee roasters and cafes are continually being planted all over LA, that there's no longer a need to search far and wide for a good macchiato wherever you are. 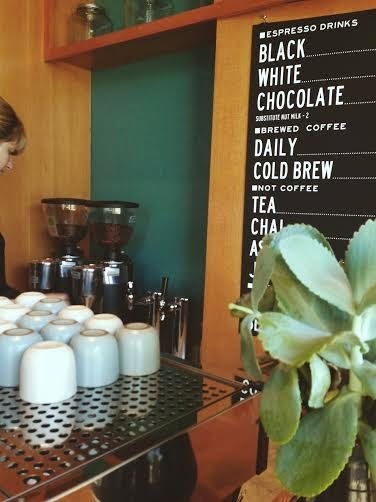 Spring for Coffee, Stumptown, Copa Vida, Handsome and Blue Bottle, the list goes on and on. I love coffee, but I'm still new to learning about beans, sourcing, quality, and everything about it. My palate can't tell the nuances between the good and very good, but I love that there's so much fascinating detail and much to learn about it all. Blacktop is another to add onto that list. The tiny cafe is in the Arts District of Downtown, close to Wurstkuche and Poketo. Their cold brew is the best I've had from any other - smooth, with a superb balance of brightness and deep subtle roastiness. A real elementary description, I know, but my taste buds are trying to explain themselves the best they can. Yes, good roastiness. Another detail I loved? You'll see them in the photo above. Heath cups.